Currently the plant meets existing air emission standards. On July 1, 2016 however, the MOECC emission standard for hexavalent chromium will be reduced by 99.5 percent. The Ministry acknowledges that it may take time for some facilities to make the significant adjustments and investments needed to improve their air emissions and to meet the new standard under all operating conditions. The Ministry created the site-specific standard application process as a compliance option for facilities that are reducing emissions to air as much as existing technology and best practices allow. Owens Corning is pursuing this option in accordance with the Ministry’s guidance and oversight‎. The plant has begun implementing changes in anticipation of the upcoming changes to regulatory requirements. It has invested several million dollars in technology to reduce the creation of hexavalent chromium during manufacturing. It also plans to invest another $10 million to refurbish its furnace, which will further help to reduce emissions. The modeling performed by environmental consultants guiding Owens Corning through the process predicts that once all steps are taken, the plant can achieve an 85% reduction in emissions. This significant reduction is the basis of the plant’s request for a site specific standard. 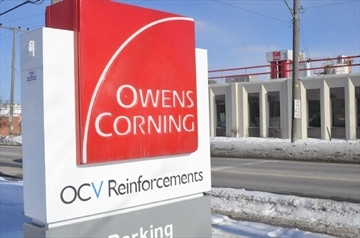 If the MOECC approves the plant’s request, Owens Corning will maintain air emission compliance while it continues to undertake improvements toward meeting the future provincial standard‎. There is a website, www.ocguelph.com and on December 3, 2015 the MOECC posted the Site Specific Standard Approval Review to the Environment Registry for a 60 day comment period. I encourage all residents to submit your questions and comments for MOE consideration. In addition I have recently been in contact with the MOECC’s Sr. Regulatory Toxicologist responsible for this file and have received the following correspondence in response to resident concerns. I’ve posted the response here for your information. As always I am more than willing to discuss in person however, I also want to encourage residents to reach out to our Provincial MPP’s office with your thoughts/questions, as this is a provincial process. Correspondence received January 19, 2016. Thank-you for your email concerning human health risks associated with the proposed site specific standard for the Owens Corning facility for hexavalent chromium (Cr6). A site-specific standard is an air concentration approved by the Ministry of the Environment and Climate Change (the Ministry) for an individual facility that is challenged in meeting the air standard. This compliance approach focuses on actions an individual facility can take to reduce emissions to air as much as possible, considering the technology that is available and best operational practices. Economic factors may also be considered. When the Ministry reviews a site-specific standard request, it requires the facility to submit information about potential exposures. This includes a more detailed assessment at specific locations where human exposure is likely (e.g., schools, homes) and includes consideration of the frequency, magnitude and duration of exposures above the air standard. This allows the ministry to evaluate the potential effects that may result from the facility’s emissions. The modelled (or expected) maximum concentration of Cr6 resulting from the facility’s current operation is 0.0208 micrograms per cubic metre (µg/m3). If a person were to be continuously exposed (from birth until death) to the current modelled concentration of Cr6, it would be associated with an increased lifetime cancer risk of approximately 2 in 10,000. It should also be noted that although this concentration is approximately 200 times the standard, this maximum concentration occurs directly south of the building near the property line and away from the residential area. In the residential area, the current Cr6 concentration is about 10x lower than overall maximum mentioned above. This is associated with a lifetime cancer risk of approximately 1 in 100,000. Although above the standard, this is within the range of risks considered negligible by the Ministry and other jurisdictions reviewed (e.g., Health Canada, US Environmental Protection Agency). The new provincial air standard for Cr6 standard is 0.00014 µg/m3 and comes into effect in July 2016. This standard is based on a 1 in 1 million increased cancer risk to humans. As a part of the site specific standard request, Owens Corning has proposed an Action Plan that includes significant technology changes in 2016 to reduce hexavalent chromium emissions, and thus, lower potential exposure concentrations. The ministry expects these actions will result in an 88 per cent reduction in the concentrations of hexavalent chromium to 0.0024 µg/m3. If a person were to be exposed to this concentration over a lifetime, the associated lifetime cancer risk would be approximately 1 in 100,000, which is approximately 20 times the standard. As above, this overall maximum concentration is expected to occur near the property line and away from the residential area. In the residential area the maximum concentration is slightly above the standard (approximately 4 times) and is associated with a cancer risk of approximately 4 in 1,000,000. Both concentrations are within the range of risks considered negligible by the Ministry and other jurisdictions reviewed. Together, based on the available data, the current and expected concentrations in the residential community are not considered to be associated with demonstrable adverse health effects.